Laksa noodle soup is a super-flavorful Malaysian dish. The soup is thought to be a blending of Chinese and Malaysian or Javanese cuisines, either through the merging of cultures or intermarriage. There are two significant kinds of laksa, each with several variants, depending on the region. The basic laksa is sometimes called curry laksa. The most popular curry laksas include a paste made up of shallots, garlic, turmeric, lemongrass, candlenut or cashew, and galangal. 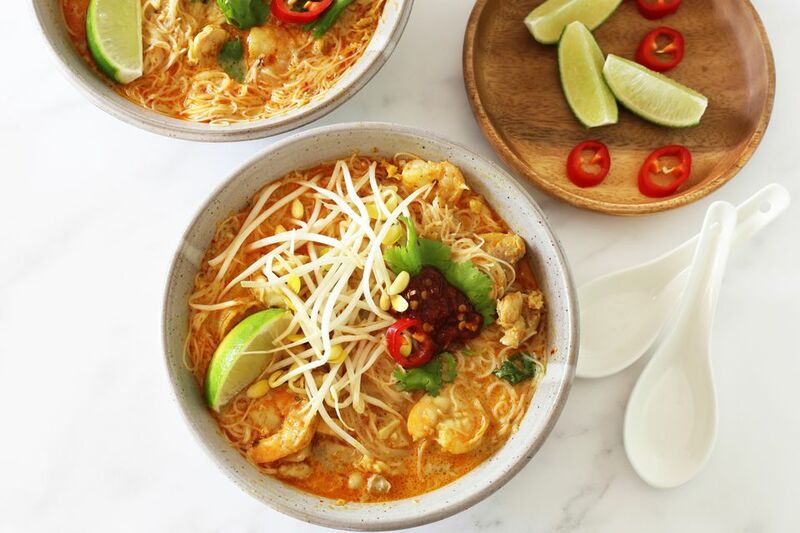 Coconut cream or milk, stock or broth, lime juice, and bean sprouts balance the bold paste along with chicken, shrimp, or tofu, or a combination. Garnishes include crispy fried shallots, cilantro, sambal or a similar chili paste, and sliced hard-boiled eggs. Asam laksa is the other popular version of the soup. Asam laksa is a fish-based soup made with a sour-flavored paste which includes tamarind, chili peppers, shrimp paste, turmeric, and galangal. Shredded fish—usually mackerel or sardines—is included in this version. It is commonly garnished with julienned pineapple, cucumber, sliced onion, lettuce, and mint leaves Both kinds of laksa soup are served with rice noodles or vermicelli. This version is a curry laksa. The balanced flavors of the soup are complex, but the store-bought laksa paste makes the soup surprisingly fast and easy to make and cook. This recipe for prawn curry laksa includes a homemade spice paste. Heat the peanut oil in a large saucepan or Dutch oven over medium heat. Add the garlic and ginger and cook for about 2 minutes, or until softened and aromatic. Add the laksa paste and continue cooking for 2 to 3 minutes. Add the chicken stock and brown sugar; bring to a boil. Meanwhile, dice or slice the chicken into bite-size pieces. Peel and devein the shrimp. Add the chicken to the to the broth mixture and reduce the heat to low. Simmer for 5 minutes. Add the shrimp and cook for 2 minutes longer. Add the coconut cream and tofu puffs, if using. Heat through. Stir the lime juice into the soup and add fish sauce, to taste. Meanwhile, soak the rice noodles in boiling water as directed on the package. Drain the noodles and divide them among six bowls. Ladle the soup over the noodles and then top with about 1/4 cup of fresh bean sprouts. Garnish the soup with a teaspoon or two of sambal along with lemon wedges, cilantro, sliced hard-boiled eggs, or crispy fried shallots, as desired. Tofu puffs can be found in the refrigerated section of Asian markets. They absorb the flavorful broth and add protein to the dish. Crispy fried shallots are a popular condiment in some Asian countries. To make them at home, slice three or four shallots thinly. Heat 1 cup of peanut oil in a medium saucepan over medium heat. Add the sliced shallots and cook for about 15 minutes, stirring occasionally, or until golden brown. Transfer the shallots to paper towels to drain thoroughly.